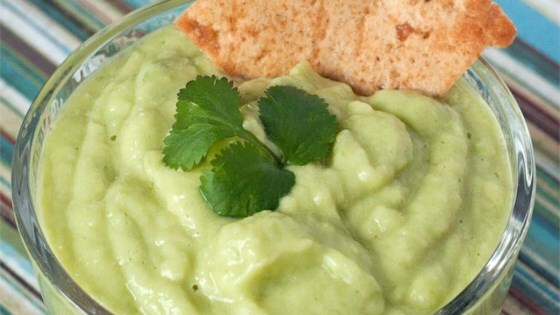 "This light and refreshing avocado dip is made with a bunch of green things. We call it Green Stuff." Combine the avocado, lime juice, green onion, cucumber, salt, and water in a blender; blend until smooth. Peppers stuffed with rice, sauce, and seasoned beef and topped with cheese. This was very tasty. I did modify it by leaving out the water and adding a 1/2 cup of Sour Cream, a splash of vinegar, dill, and a couple of jalepeno slices for a little kick. Very very good! This was the best guacamole I've ever made, and I would have to say it was the cucumber that made it so amazing! Very yummy! I may have rated it with 5 stars had I not used the water. It is very light though and without the water would be great on fish tacos. I used garlic salt instead of regular salt.